The Gulf Coast Section of SEPM, the San Antonio educational community, and the geologic profession in general, lost a very active and treasured friend when James Jones, Associate Professor of Geology at UTSA, died on October 4, 1999, of complications resulting from brain cancer. James was born and raised in Electra, Texas, near Wichita Falls, and attended Punkin Center School and Electra High School. 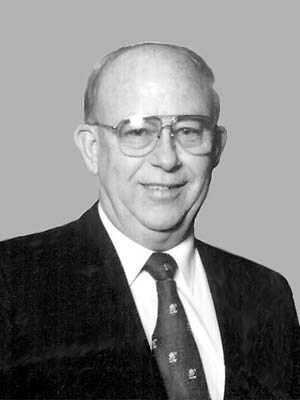 He graduated from Midwestern State University in 1962 with a BS degree in Geology, and received his MS degree in Geology from Baylor in 1964 and his PhD degree in Geology from the University of Iowa in 1971. His dissertation was on the Blaine Formation (Permian) of North Texas. He began his teaching career at Southern Arkansas University, where he became Chairman of the Geology Department. In 1977, he moved to UTSA, where he remained for the rest of his career, teaching graduate and undergraduate courses and advising graduate students. From 1978 to 1983, he served as Geology Program Chairman in the Division of Earth and Physical Sciences at UTSA. James spent most summers as a consultant for Shell, Texaco, and various other companies, both major and small, on mineral and oil and gas evaluation, and for federal organizations in waste management and other environmental programs. James placed a high value on professional organizations, to which he contributed a great deal of time and effort in a number of capacities. The GCSSEPM was one of the primary beneficiaries of his dedication and leadership. James not only served the Section in official positions as Vice President in 1996, President Elect in 1997, and President in 1998, but he also played a more informal role as a provider of much valuable, and greatly appreciated, advice. James also served the GCAGS in a variety of ways, taking on the demanding job of Editor of the Transactions in 1996, and chairing the GCAGS Awards and Nominations Committee (1997-99). He was a Fellow of the GSA and the Texas Academy of Sciences (Chairman of the Geology Section, 1994-95), President of the STGS (1994-95), Vice President of the San Antonio Chapter of SIPES (1995), and a member of numerous other societies and committees. At the time of his death, James represented the STGS as a member of the AAPG’s House of Delegates. He was certified as a professional geologist by both AIPG (CPG 7039) and SIPES (2220). While still a PhD student, James began a distinguished military career, serving on active duty as a Commissioned Combat Arms Officer with the 32nd Army Air Defense Command from 1968 to 1970. He remained with the US Army Reserve until 1995, when he retired as a Lt. Colonel. Among military commendations that he received were the Meritorious Service Medal and the Army Achievement Medal. He was buried with full military honors in Burkburnett Cemetery, Burkburnett, Texas. James is survived by his wife Marilyn, two sons, and two grandchildren. But a mere listing of James’s professional accomplishments, impressive as they are, tells only part of the story of who James Jones really was. His legacy must include his students, who speak, almost reverently and certainly affectionately, of classes, directions, and time in the field with "Dr. Jones", as they still call him, even after graduation. James’s students, both graduate and undergraduate, are not only well versed in geology, but are well prepared for the professional world beyond the university. He was particularly concerned about the students’ entry into professional Earth Science, promoting their education by founding a Student Chapter of AAPG, and coaching them on professional behavior at meetings. James encouraged student membership in professional organizations, successfully lobbying for scholarships, and sponsored the local chapter of the Student Geological Society at UTSA. His students hosted an ambitious field trip for the Southwestern Association of Student Geological Societies in 1994, which set a record for attendance. James continued as educator outside of the classroom in many other ways as well; he was a Boy Scout leader and could always be counted on to help judge science fairs. While James was a Master’s student at Baylor, studying under O. T. Hayward, he became acquainted with the Cretaceous rocks of the Hill Country; his thesis was on the Walnut Formation of Central Texas. Later, when he began his teaching duties at UTSA, this acquaintance grew into a close relationship. Not only did several of the Master’s theses he directed at UTSA concern various aspects of Cretaceous rocks, but he conducted numerous field trips, both formal and informal, in conjunction with his courses or on his own time, with colleagues such as Dave Amsbury, Bill Ward, Perry Roehl, James Lee Wilson, Ed Roy, Gerald Rolf, and Tom Ewing. Jones and Amsbury shared their knowledge of the Trinity (Lower Cretaceous) of the area north of San Antonio by leading field trips at the GCAGS convention (1996) and the AAPG annual meeting (1999). A little-known, but significant, example of James’s dedication to education at all levels occurred early in his tenure at UTSA. At the request of the Eagle Pass, Texas, school system, he made weekly trips to Eagle Pass, on the Mexican border, to teach geology and earth science to high school students from families of migrant workers. These students had missed several months of school while working with their parents, and when they returned to school, they were not as academically prepared as their classmates. The fact that he had to drive 200 miles and did not get home until around 2:30 AM did not seem to deter him. In short, he did many things, and did all of them well. He was a very good man, a very good geologist, a very good teacher, and a very good friend. He touched the lives of so many of us in so many positive ways. We will miss him dearly. Dena Schmidt, one of James’s students from UTSA who is now Treasurer of the STGS, and Dave Amsbury, a close friend and colleague who is now teaching James’s courses, contributed to this memorial.